Loki’s faces will never cease to greatly amuse me. Nor will Coal’s. In fact, I think i’ll just be greatly amused at anyone’s comical expressions. Haha, thanks! XD I love drawing expressions. 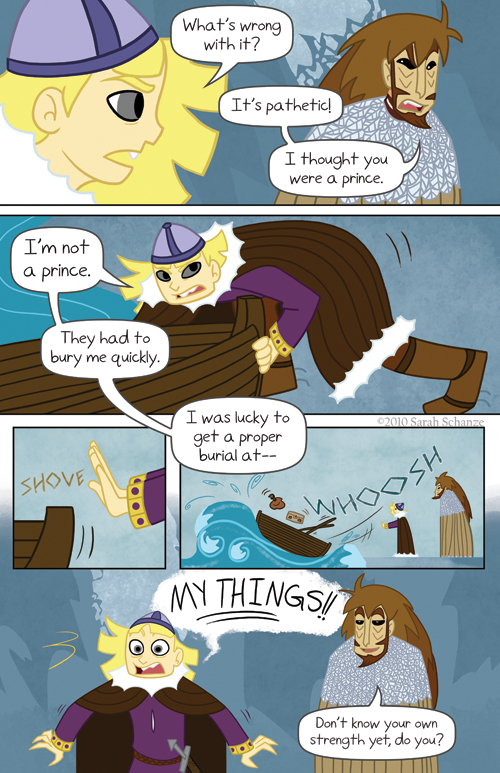 Why did Loki think he was a prince? What’s going on with Loki in the sketch? Why is Nemo from ‘Finding Nemo’ floating above young Coal’s head? The sketch looks like a colorless, backgroundless, word bubbleless comic page. “Come with me little boy, I have mjollnir necklaces in my van”. Loki seems to be enjoying the boat sailing away…. OH MAN. OH. MAN. this is just all different kinds of awesome. This is the cutest comic ever yet I still find myself hanging at the edge of my seat waiting for more! i love the last panel! shock , suprise, awe, and smug amusement. you are very good at emotions. and becoming one of my favorite reads. thank you for sharing your awesomeness!